Is science media just about selling us stuff? Last month, I chaired a debate at the Royal Institution exploring the different expectations scientists and journalists have for science media. I was asked to write up my notes for the Guardian science blog, and picked out three questions from the many we discussed on the night. 1. Is climate change a qualitatively different issue from more general questions about science in the media? Any area of science is different from another: we should be careful of talking about science as if it were a cohesive whole, just as we should be careful of lumping together the whole of ‘the media’ too. Still, I think there is a lot to be said for taking time to consider what it is precisely about climate science that distinguishes it. As Joe Smith argued recently, the topic is rather a hard sell for the media: “Climate change science is looking at the long term, slow moving, run through with uncertainty and is […] at least for the foreseeable future, unfinishable. It represents one of the most ambitious intellectual projects of our time. It is our moonshot.” I’d add that it’s also a young science in many ways, it doesn’t have the same sort of political and cultural infrastructure of quantum physics or human genetics. You’d probably have to be in your early 30s or younger to have done much climate science at school. In a more cynical mode, I’d also posit the suggestion that climate change, unlike other science media issues like GMOs, nanotech or BSE, isn’t about selling us products – quite the opposite, arguably – and that might explain a certain lack of political will when it comes to supporting public communications work. 2. How do we ensure science news is reported in the public interest? I was pleased to hear the topic of the public interest raised, and it’s a topical one in the UK as we consider a possible replacement for our Press Complaints Commission (e.g. see the Wellcome/CRUK submission to Leveson, pdf). Still, I worried that the discussion of the public seemed to end here. I wanted to hear more about opening up science media to involve audiences, a sense of the public as a resource not simply an audience to be protected and looked after. Such work doesn’t have to be a matter of ignoring scientific or journalistic professional expertise and skills, just doing things in public to open the conversation a bit (Leo Hickman’s EcoAudit is a lovely example of this). 3. Should journalists read the scientific papers they write about? This question had caused a fair bit of fuss on the night, and was later explored in detail in a great post from James Randerson. I couldn’t help but think it was a bit of a distraction though: it’s the notion of a scientific paper that’s the problem, not journalists. A paper really isn’t the most efficient way of sharing scholarship, is it? I’m slightly cynical change here is possible, I suspect the publishing industry is too powerful for meaningful change. Overall, I left the event at the RI, not for the first time, worried that if we leave science media to commercial intersets that surround science rather than paying for a newspaper, museum exhibition or public funding via taxes, then too much of the public debate on these issues end up bankrolled by those with an interest in selling us stuff. Advertisers. Sponsors. Tobacco. Oil. Supermarkets. The arms trade. Science that doesn’t sell us stuff – or tells us not to buy – gets quietened. I don’t want to suggest that if commercial interests are involved in science communication the work becomes somehow invalid (I’ve worked on sponsored science communication myself) but it is something to keep our eyes on. I recently re-read a paper by Charles Thorpe and Jane Gregory which takes a critical look at increased moves to public participation in science alongside commercial exploitation of scientific knowledge. That paper’s open access, but not the easiest read if you’re not of a sociological persuasion. If pragmatic examples are more your thing, it’s worth reading up on Brian Wynne’s resignation from a Food Standards Agency steering group or perhaps Gaia Vince’s story of when SEED magazine spiked one of her articles because it was critical of a potential advertiser on advertisers. For me, a lot of this boils down to a lack of public debate over political and commercial of science itself, not just who pays for science museum exhibitions or advertises in science magazines. I think there should be more public discussion of science policy. We shouldn’t just be having debates about whether scientists and journalists have different views over what counts as “good” science media – or if this frame mises out the role of press officers or the public – but how we might involve policy makers and political activists more productively in the conversation too. I can see why people worry if and how science media can clearly communicate scientific knowledge, but it should also open up questions about how science is made and what we want to do with it too. Here’s my final question: how can science media more effectively discuss commercial interests of science, rather than just being constrained by them? This entry was posted in events, guardian, media, science and tagged climate science, events, media, newspapers, public engagement, science on April 5, 2012 by alice. This week, the Guardian’s science blog published Tim Radford’s Manifesto for the Simple Scribe. It’s a lovely set of tips for better writing which has been passed around the UK science writing community since it was first written in the mid-1990s. I was really sceptical it’d appeal to a broader audience. I was wrong. As soon as it was posted, it spread quickly on twitter and facebook; spread with warmth and across the globe. I’ve seen tweets about it in several different languages. It’s currently the most-read piece on the Guardian science pages, even beating the story about the astronaut falling off his bicycle. Ian Sample asked a great question when he shared a link to the manifesto: this was written last century, what would you change? This is my attempt at starting an answer. I’d be interested to know what others think. Martin Robbins suggested twitter ‘nukes’ point one (that you’ll never meet your reader). I think Robbins is right to draw our attention to a change in read/ writer relationships, but I’m not sure nuke is quite the word. It’s only a small percentage of readers a writer is likely to interact with. The loud ones, the bored, the ones with an axe to grind or, more positively, those that feel some relationship with the author or community of other commentators. Yes, it’s easier to do this and twitter lets you talk to them. You can also watch people sharing your work, using sites like topsy.com. This is more than was available a few years ago, but it’s no where near comprehensive. It’s also a development of structures for relationships with readers that were already in place: It’s worth remembering that Radford was letters editor before he moved to the science desk. The manifesto was published on the run-up to a Q&A with Radford we held at Imperial on wednesday. A member of the audience there asked him how he felt about readers comments when his writing ends up on the web. Radford said he’d found himself ‘depressed, but also profoundly impressed’ by these. On the one side there were those commentators who react to some key word like ‘climate’ and ignore what you’ve written, ranting off about something else entirely. But then he had also witnessed experts on a topic find each other through comments and develop ideas mentioned in a piece, making something new from their interaction. I thought it was fascinating that both of these examples were a matter of readers interacting really without the need for the writer. Maybe that’s a function of an old-media writer, one that is slightly unaccustomed to building a relationship with readers through comment threads. I suspect a similar list written today would include some tips on how to work productively with the people formerly known as the audience. But I also think it’s partly a matter of working for a mass-media brand, and there are practical difference between the crowded space of the Guardian and a cozy personal blog. I’m not entirely sure it’s appropriate, or possible, to expect one to try to be the other. I know I teach differently in a large lecture theatre, compared to a small seminar room (or a meeting in my office with one or two students). I’m not sure we can expect writers to meet their readers, especially when writing online, as texts may become all the more open. Or at least we can’t expect them to meet all of them. To allow the illusionary interactive feel of twitter con us into thinking we have would be silly. The manifesto doesn’t really talk about linking, a point made critically in the blog’s comments. If anything Radford makes a point of stressing linearity for clear writing (though he does mention putting ‘twiddly bits’ in, see point 10). I think linking is part of the art of being a writer in the 21st century. I think it is something writers have to think carefully about, take time over, will get better at over time, and will develop their own distinctive style for. I suspect it is a skill which the wise old writers of the future will be keen to share tips about, and in that respect this manifesto shows itself up as a bit 20th century. For me, the biggest difference between today and the 1990s is the way the online communication means it easier to get away with writing for rather niche audiences (a small percentage of the WHOLE INTERNET still being a fair quantity). Much of this manifesto reads like tips for sharing science to as broad an audience as possible. It’s classic mass-media communication. Today, a writer for the Guardian might want to speak to as many people as possible, but the many bloggers who will have lapped up Radford’s advice won’t necessarily feel the same way. I suppose niche writing has always existed though, just as I think there is an ongoing market for writing which aims to share a piece of science with as many people in the world as possible. Indeed, one might argue that because niche communication now increasingly happens in relatively public spaces of the web, there is a need to make it digestible to diverse audiences. Similarly, we might argue that as science becomes increasingly specialised, all science should be easier to understand outside the small community of peers which produced it (and that goes for the composition of journal articles as much as anything else). Another question we might ask is whether this desire to talk share science with a mass audience ever really held true, even back in the 1990s? When I posted a link to it on twitter, I did so with the quote: ‘No one will ever complain because you have made something too easy to understand’. Mariette DiChristina, the editor in chief of Scientific American, re-posted this with the comment ‘Except some SciAm readers, who will!’. She has a point. I’ve heard complaints along these lines too. Indeed, we could see some in the comments to Radford’s piece, many incorrectly conflating ‘easy to understand’ with patronising the audience. I suppose it’s a slightly utopian statement in some respects, a challenge (see also point 4, on journalism never being self-important). And that, in the end, is my answer to Sample’s question. Yes, these tips are a decade and a half old, but it’s a manifesto. As such, it’s a statement of desire born out of an awareness of what is understood as some key problems. It is a statement of hope, not matters of fact. Our tools for science writing may have changed slightly, and I do think this has an impact on what we expect of it, as well as the relationships between scientists, writers and readers. But I don’t think our ideals for science writing have really changed that much. This entry was posted in blogging, guardian, journalism, newspapers, web and tagged blogging, guardian, journalism, newspapers, web on January 21, 2011 by alice. A colleague asked me for a list of blogs that next year’s science communication MSc students might like to read. I figured the only way to share this information was in a blogpost. Warning: there is no such thing as a reading list of science blogs, you need to explore for yourself. These are just starting points. If there’s a hot new biology story, you can bet Ed Yong will have a thorough and humour-filled post over a Not Exactly Rocket Science. He also regularly writes about issues in science and (new) media too, and his recent thread on the origin of science writers should be of particular interest to science communication students. Another blog everyone recommends (and I’m just going to agree) is Mindhacks. A very joyful neuro/psychology themed read, great for sending you to some of the more interesting ends of the internet. Two notable science writer bloggers currently developing personal sites after the recent mass-exodus from scienceblogs.com are Brian Switek and David Dobbs. Carl Zimmer’s post on the scienceblogs diaspora contains a feast of links to more great writers once of this network (Zimmer’s blog is worth a mention in itself too). I expect my prospective students to already know Bad Science, and I can also recommend his posterous account. The phenomenon of “bad science” blogging is bigger than Ben Goldacre though, two blogs in particular I’d recommend because they often write about science in the media are Lay Science and Gimpyblog (most of the media discussion goes on his posterous account). Fiona Fox of the Science Media Center doesn’t blog very often, but when she does, everyone talks about it. On a similar note, Natasha Loder’s blog is worth a look, as is Framing Science, from American science communication academic, Matthew Nisbet. Real science media nerds might also like Ivan Oransky’s embargowatch. The Times & Guardian both have good (though very different) science blogs, note the former now has an “entrance fee”. I really like Nature’s the Great Beyond, and it is worth keeping track of New Scientist’s range of blogs. The Science Museum’s collections department has a nice blog, as does the Wellcome Trust. (and the Wellcome Library, and the Wellcome Collection…). Research Fortnight’s Exquisite Life is a must for following UK science policy. It is also worth having a look at the Institute of Hazard, Risk and Resilience Blog and the Campaign for Science and Engineering. The Royal Society policy team have just started a blog too, which (I hope) will be worth watching. Twitter is a good way of engaging with the science blogosphere. 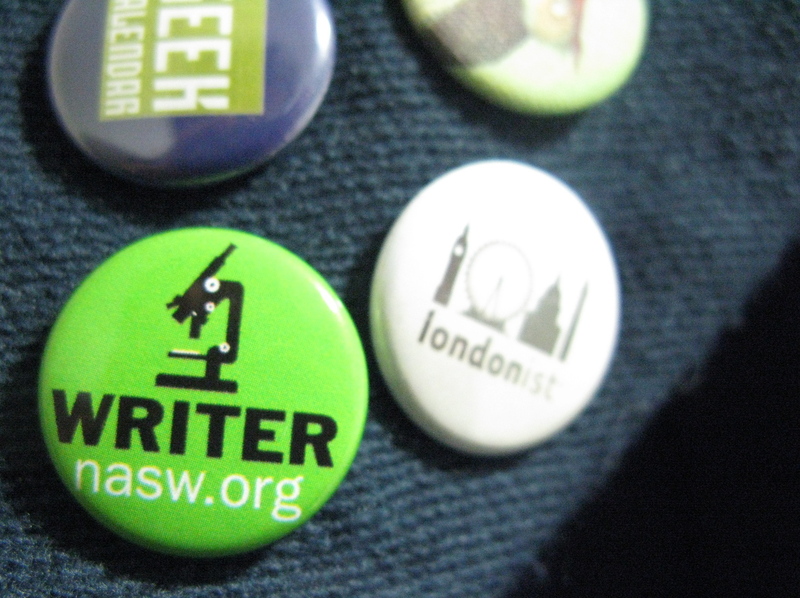 My “awesome science” list of people who write and/ or link to great science writing on the web should be a useful starting point. Twitter is also brilliant for discussing/ eavesdropping on debates about science in the media and policy, so I can recommend people on my science policy and science communication lists too. Please note, many of these accounts will tweet about other things too. These links are really just the tip of the iceberg. Or, a small section of a big chunk of ice, as I’m not sure something iceberg-shaped is the appropriate metaphor. I should also add that I don’t agree with everything these people blog/ tweet about. Not even close. They do, however, tend to write about topics a science communication student might be interested in. At the very least, they’ll point you towards some new ideas and make you think. Click on a few links here and see who they link to. See what entertains, educates or enrages you. Go, have a play. This entry was posted in blogging, museums, newspapers, policy, science, teaching, web and tagged blogging, museums, newspapers, policy, science, teaching, web on July 30, 2010 by alice.